Many backyard birders claim that they dislike Starlings because the Starlings “eat all the seeds” that are put out for their other birds. In fact, Starlings are not seed-eaters, and cannot even digest the hard shells. Starlings are a biologically primitive species, and, unlike most songbirds found at our feeding stations, they have no crops. European Starlings are primarily insectivores and, in fact, do an incredible job of keeping our yards free of some of the bad buggies out there. They are the #1 predator of Japanese Beetle larvae, in fact. If you love your roses, you had best not try to chase those Starlings off! If you’re seeing Starlings at your feeders, it’s far more likely that they are eating the suet, peanuts, or cracked corn in the mix rather than the hard-coated seeds. They may even be chowing down on the insects that contaminate the seed mix. Starlings were called the “poor man’s mynah” in Europe and Great Britain. Why? Because they talk. They talk well — better than many birds more commonly thought of as “mimics”. They readily pick up human speech and, having lived with three talking Starlings for a number of years now, I will gladly attest to the fact that they not only talk — they converse. It is known that many birds, including Starlings, learn the communicative song of their flock. It’s also widely accepted that these sounds have a pattern and meaning, with different “words” used to relay consistent concepts among the flock. Starlings don’t seem to mind if their adopted flock is a human one. They, like their wild counterparts, pick up the flock’s language and often use it appropriately. 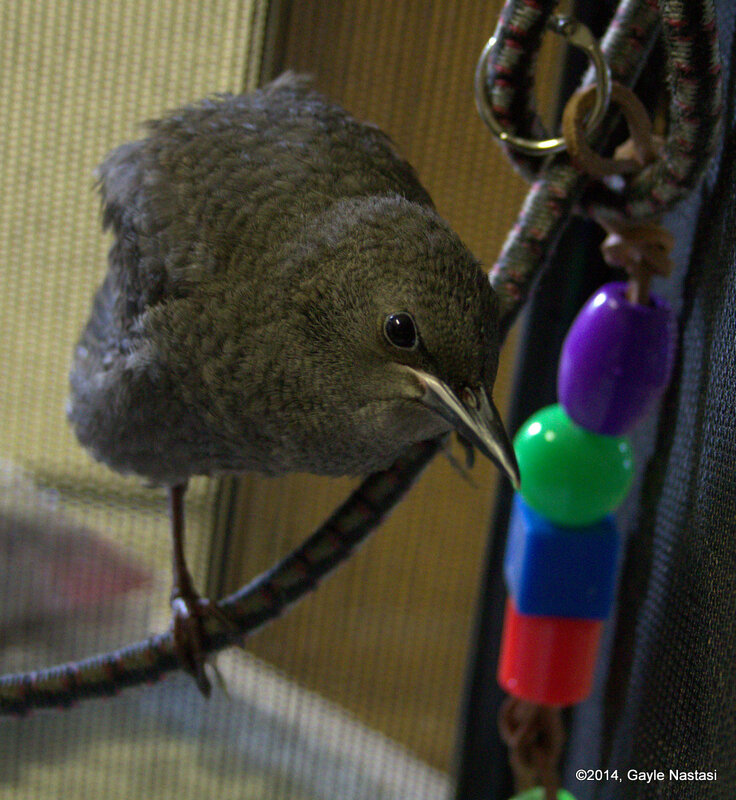 Starlings imprint very easily on human caregivers, if they are quite young when taken in. My three were tiny babies barely out of the egg, so even though I attempted to keep them at arm’s length so they would not imprint, they bonded to me and my family. Stars and Stripes, in particular, are extremely attached. If loose in the house, they have no desire to fly around and exercise — they aim for the nearest human head or shoulder to hang out with their special friends. All three of my Starlings talk, and well. Stars, however, is the one who most enjoys conversation. She often seems to know what she is saying, and recombines words and phrases appropriately. She never fails to amaze me with the things she comes out with. I wish the birds weren’t so camera shy, as I have been trying for years now to catch her “I’m watching Mommy!” routine on video. I do have a new clip on my website of a brief “watching Mommy” interaction. It is located in the “Nastasi Birds” post, which can be found at the link below. It seems that Starlings like psychological crime shows. “Perception” has a new little member of its fan club. Too bad it’s been canceled. We won’t tell Stars, okay? My three little friends make me smile on days I can’t find much else to smile about. They started saying “Mommy” and “Where’s Mommy?” while I was hospitalized back in 2008, in horrific pain, thinking I was going to lose my leg. What a great motivator it was; my desire to hear that in person contributed to my determination to get well enough to come home. Their antics, humor and affection still keep me going. It is not a far stretch to say that without these little feathered clowns, I might not have recovered as well as I have. Laughter is the best medicine, and there were days back then when the only laughter that could break through the pain was a gift from my Starlings. I offer my sincere apologies to Mister Dickens, but I shall never apologize for my Starlings. They’re the best! A Cautious Endnote: While in most states of the US, it is legal to keep Starlings (and English, aka “House” Sparrows) in captivity, this is not true in every state and every area. Before adopting a Starling or Sparrow, be sure to check with your state and local regulations, which may over-ride federal law. Links to my Starlings talking can be found on the “My Animal Family” page of the website. Just scroll down to the birds’ section of the page.